After a few days of play with my new Desiderata flex pen, I would like to present a short little “review” and hope it is useful. I purchased the pen via Etsy (sold out, find the old page here: https://www.etsy.com...ction/218729604) and I really enjoyed the communication with Pierre, who answered my questions and requests promptly and very friendly. He was also very open and honest about how he got along with the production. The pen is made of wood with a shiny glossy finish. The section is made of plastic and has a slightly “rippled” shape - it feels good to the touch, not slippery or uncomfortable in any way. Also, the section is long enough that my fingers are not on the threads. The pen is quite light (I have no balance here, but can deliver the measures tomorrow, if needed) and well-balanced for my taste. The cap cannot be posted, but the barrel is big enough anyway to hold very nicely. The cap will not roll away due to a small roll stopper. The Zebra is actually a nib for dip pens and not stainless. It will therefore rust in permanent contact with ink. Therefore, I take out the Zebra G after playing with the flex and replace it with the stub nib, which writes very nicely as well and should be stainless steel. However, if the Zebra G nib should deteriorate or if one flexes too much at some point, it is easy to replace and can be bought at a very low price (I hear 1-2$). 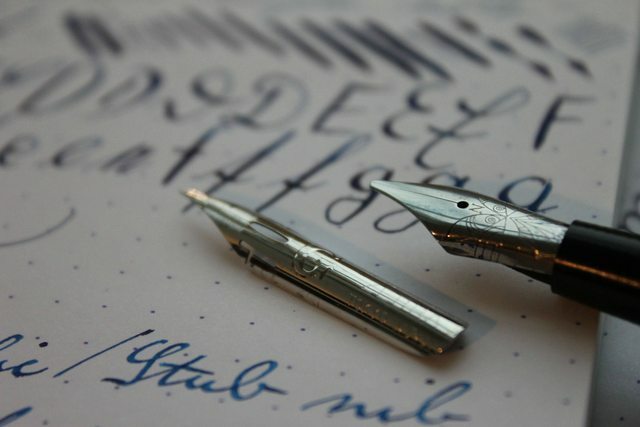 It is possible to write a very fine line with the flex nib, although it is somewhat scratchy, as expected for a needlepoint. Overall, I would not call the pen "scratchy", given my experience with other dip nibs and even flexible extra fine fountain pen nibs. 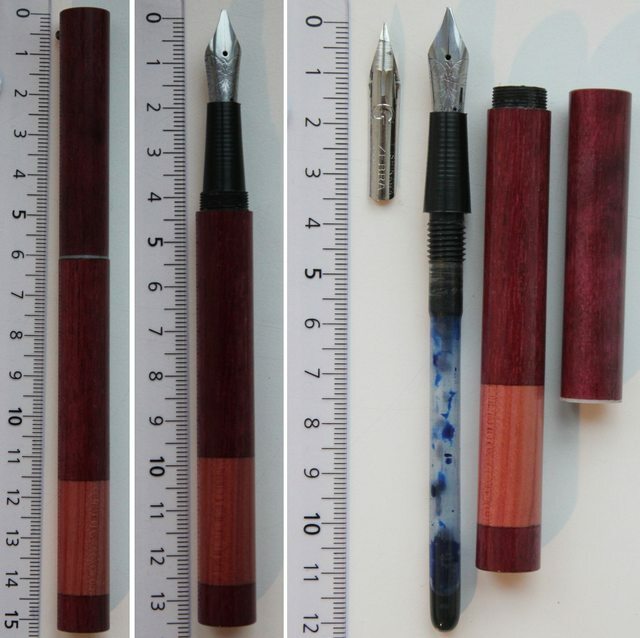 It responds with a drastic increase in line width to already low pressure, and the potential contrast in width is far more than what you can get with normal flex fountain pens (for a comparison see here: http://www.fountainp...pany/?p=3085735 and http://www.fountainp...aedalus-review/). I had no problems with railroading at my writing speed, the flow should be easy to adjust to other needs. 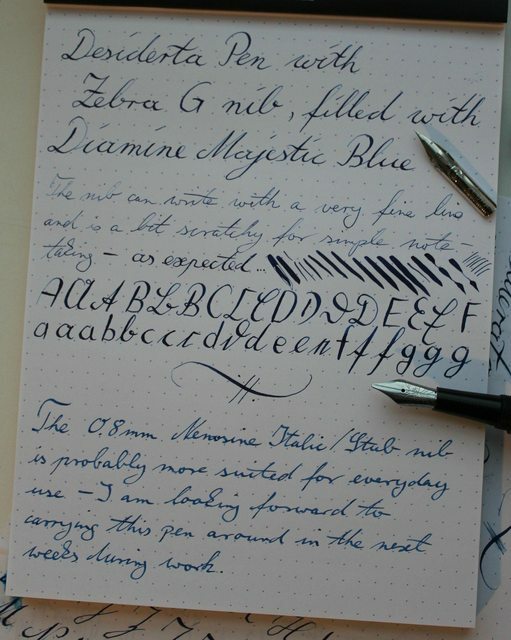 The Nemosine 0.8mm stub is a joy to write with! I will leave it in the pen and expect to use it a lot in the next weeks. All in all, I definitely recommend this pen to everyone, who wants to experience real flex without the dipping part The pen istelf is also very nice to hold and I like the stub. 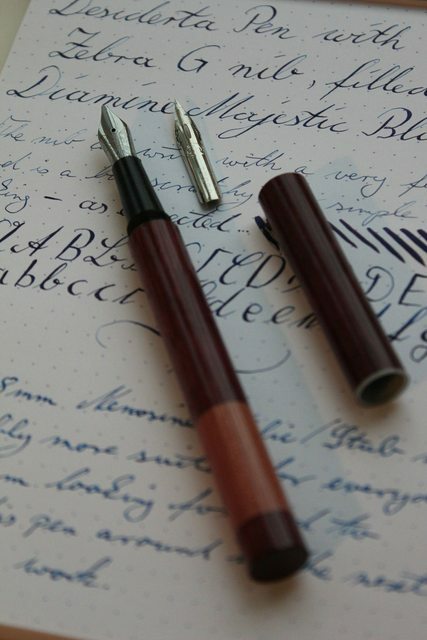 Apparently, many Pilot nibs can be used as well (http://www.fountainp...pany/?p=3084096), which gives a lot of very nice nib choices together with the wonderful wooden pen! I congratulate Pierre, who made great progress with this project over the last weeks, and I wish him good luck for the future of his enterprise! Edited by kronion, 17 August 2014 - 21:35. Thank you so much, Kronion! Very nice handwriting, too! Oh, this is exactly what I've been looking for; the extreme flex of a dip nib in a fountain pen! I have GOT to get me one of THESE!! Any chance they come in Ebonite ripple? How do you buy one? Kharrisma, that sounds excellent! Right now I'm only selling wood varieties, but I'm getting to ebonite as fast as my little hands can carry me. PM me your email address to get on the mailing list for updates. The dot com website will be up in about three weeks. Then, you'll have a few options, and a ton of helpful content. PM me your email address to get on the mailing list for updates. Definitely looking forward to checking out the website for this little beauty! I've got a whole box of G nibs waiting for a Fountain Pen home!